Eric Trump, the second son of Republican presidential candidate Donald Trump, came out to defend statements made by his father about the family of a U.S. army captain killed in Iraq, saying that the comments had been blown out of proportion. On “CBS This Morning,” the younger Trump also defended his father’s plan to take on radical Islamic terrorism. “I mean, you see anybody who dies for their nation, dies for the three of us at this table, made the ultimate sacrifice, but you know for my father, in terms of the Kahn family, it’s not about a soldier—who’s an amazing guy. 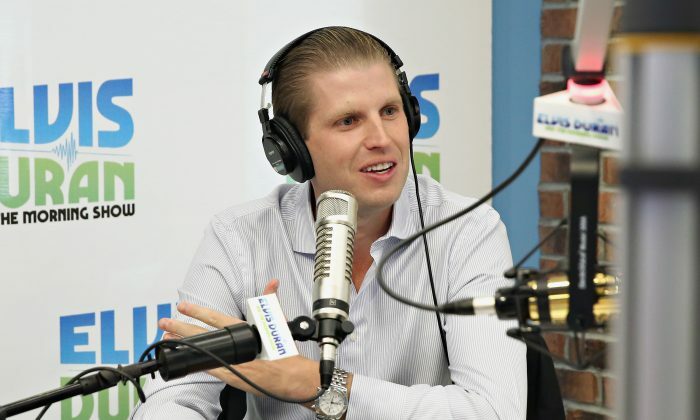 My father even said that during the interview, sounds like he’s a really amazing guy,” Eric Trump said. Eric Trump focused on his father’s plan to take on radical terror in the wake of the Orlando and San Bernardino terror attacks, as well as international incidents, including the Nice truck attack and the killing of a priest at a church in Normandy, France. Khizr Khan, the father of Army captain Humayun Khan, who was killed in Iraq in 2004, slammed Donald Trump in an emotional speech during the Democratic National Convention. Khan said Donald Trump had “sacrificed nothing and no one” and also questioned whether Donald Trump had ever read the constitution. In the interview on CBS This Morning, Eric Trump said his father had apologized to the family already. The whole situation, he said, got “blown out of proportion,” saying Trump doesn’t want to see any more Americans killed. Trump added that his father’s focus has been on security issues, illegal immigration, and Syrian refugees entering the United States. “This story is not about Mr. Khan, who is all over the place doing interviews, but rather RADICAL ISLAMIC TERRORISM and the U.S. Get smart!” his father tweeted on Monday. “I mean my father’s a great patriot, he doesn’t want to see more Americans dead and he’s seeing what’s happening around the country and quite frankly, he’s shaking his head,” he told CBS. Trump also asked why Pat Smith, whose son was killed in an attack on the U.S. Embassy in Benghazi, Libya, in 2012, didn’t receive the same amount of media coverage even though she spoke at the Republican National Convention. “Between all the news networks, she got 70 seconds of airtime. The Kahn family has gotten hours and hours of airtime, and what’s ironic about that was Hillary was the one that left them on the roof in Benghazi. It was Hillary’s policy that crippled Libya and Syria and Iraq,” he said.